President Trump spoke with members of the US Customs and Border Patrol as he toured the border wall between the United States and Mexico in Calexico, California, on April 5. 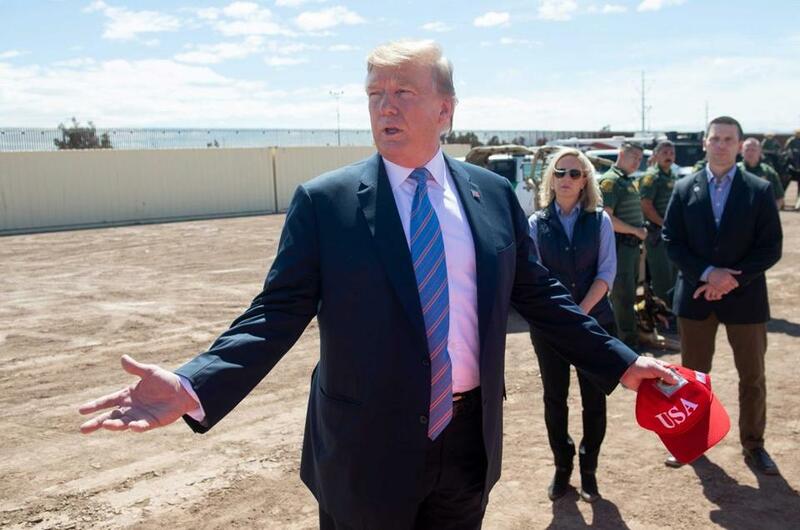 WASHINGTON (AP) — President Donald Trump wants to explore a twice-rejected proposal to send migrants to ‘‘sanctuary cities,’’ but that is not the preferred solution to fix the straining immigration system, the White House said Sunday. ‘‘Sanctuary cities’’ are mostly left-leaning places such as New York City and San Francisco where laws prohibit local police and correction officers from working with immigration officials to help arrest and deport people living here illegally. ‘‘This is again his manufactured chaos that he’s created over the last two years on the border,’’ Thompson said of Trump, adding Democrats were more than willing to sit down and talk about immigration legislation. ‘‘I mean, maybe he’s just saying this to make everybody crazy,’’ he said of Trump. Sanders appears on ABC’s ‘‘This Week’’ and ‘‘Fox News Sunday.’’ Scott was on CNN’s ‘‘State of the Union’’ and Inslee was on NBC’s ‘‘Meet the Press.’’ Thompson appeared on ABC.